A little less than two years after being killed in battle against an adult clone version of himself (Aren’t superhero comics fun? ), Damian Wayne has returned to the DC Universe to reclaim his position by Batman’s side. Still, Bruce Wayne’s son isn’t the same character as before. Damian’s attitude is as aggressive as ever, but his cosmically powered resurrection had some significant side effects, granting him new superpowers that make him the Bat-family’s most powerful member. As of now, it’s been revealed that Damian has invulnerability and super-strength, and this preview of next week’s Batman & Robin #38 reveals how his new abilities impact his work as Robin. Writer Peter J. Tomasi spent most of last year exploring different facets of the DC Universe as Bruce Wayne searched for a way to bring his son back to life. But the action returns to Gotham City with next week’s issue, and Damian is eager to get back to fighting crime. 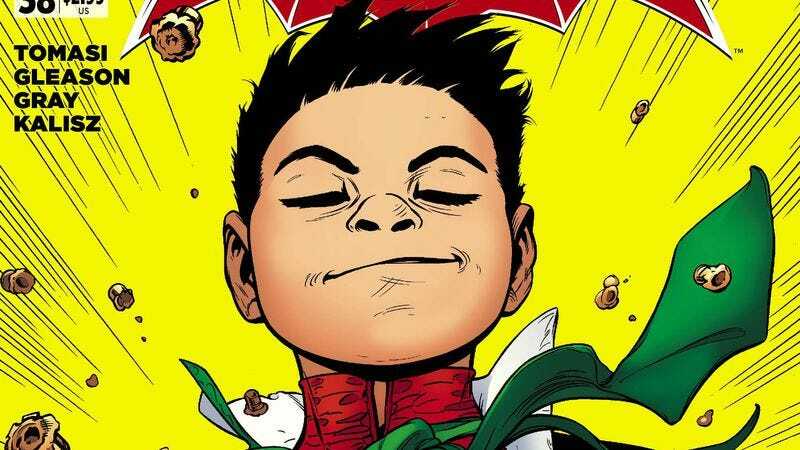 The return of Damian also brings a return of humor to the script, and the comedy in these pages is a stark contrast to the dire tone of the stories that took place during the boy’s absence. One thing that hasn’t changed over the course of this series is the exceptional artwork by Patrick Gleason, inker Mick Gray, and colorist John Kalisz, whose collaboration has resulted in consistently stunning visuals. The two splash pages in this preview do phenomenal work creating a specific mood and atmosphere with the framing, shading, and color palettes, and that last shot of Damian charging into a bevy of bullets highlights the meticulous detail that Gleason and Gray put into the linework. Batman And Robin is a gorgeous book, and Damian’s new power set should elevate the art even higher as the creative team explores the new opportunities his abilities bring to the action.